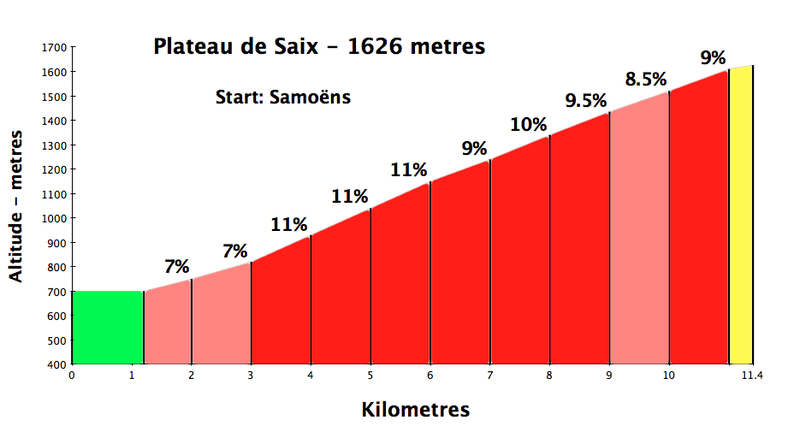 Like the celebrated Col de Joux Plane, Plateaux des Saix starts in Samoëns. While it is far less known – in part because it is a dead-end – it shares similary stats with Joux Plane but is in fact quite a bit more difficult. I last rode it in 2008, and I complained about the road surface, but it’s in good enough shape now. 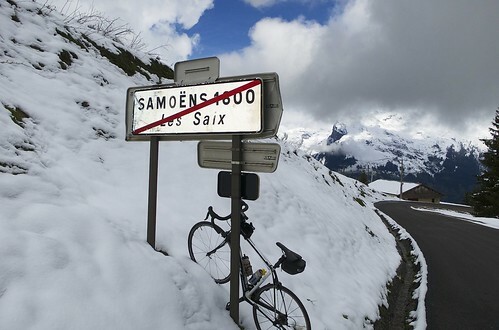 The summit is also called Samoëns 1600, and is part of the Grand Massif ski domaine (Flaine, Les Carroz, etc). As the profile shows, after the first 2 kms, it’s hard work. With three consecutive kms at 11% average, ouch! Everyone has been complaining about the never-ending winter. But, I decided to trust the weather forecast that the seemingly daily rain wouldn’t start for several hours, and I felt pretty good on the steep slopes. The last few kilometres were covered in new snow, but I kept dry and enjoyed myself even if the usually spectacular views were clouded over. 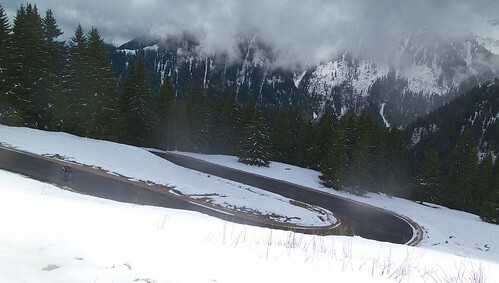 Joux Plane is still closed, so after descending I decided to visit Cirque du Fer à Cheval at the far end of the valley. 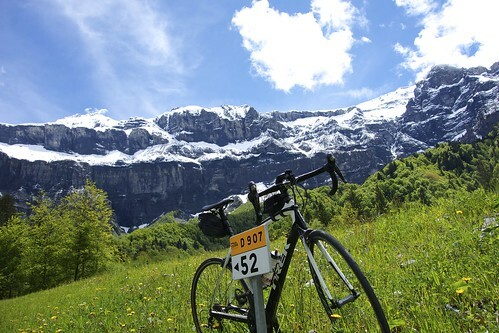 It is a stunning amphitheatre of mountains similar to Cirque de Gavarnie in the Pyrenées. It is perhaps 300 metres of ascent but it’s not at all steep, and a popular cycling route. There is a loud river beside the road that has white water rafting. Plenty of cliff waterfalls, etc. It’s truly a special place. Note, one can get further into this beautiful site by hiking or mountain biking. Highly recommended location to visit – with or without a bike. 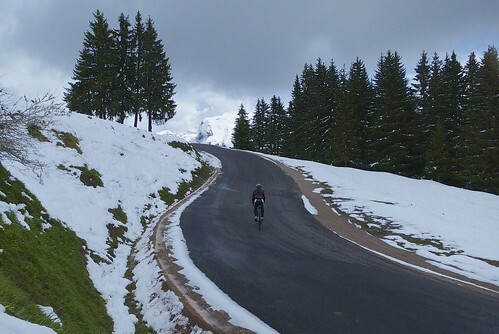 This is much, much harder than Joux Plane. And unfortunately there isn’t much payoff. You basically have to turn around after getting a drink at the ski station, which is kind of ugly, and the view to the north toward Geneva is nothing special. However…it’s a special kind of suffering at the bottom, and if you like that — I do — then this should be on your list. I am in pretty good shape, at least in the summers, and the first 5 k out of Samoens 1600 nearly killed me. There are some nasty, nasty ramps, Note also that there are zero rests. (Well, there’s one SLIGLHTLY gentler section near a meadow, but then it goes right back up.) Last year I suckered my brother into doing it and he agreed that it was one of the gnarliest climbs he’d done.